The perfect choice for families and fun. You'll always look good on the go with the unmistakable upper and lower grille openings and expanded fog light housing in the front fascia. SE adds even more style to this look with a sport-specific honeycomb grille insert. Check style off your to-do list. 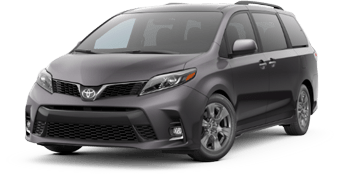 Lower side rocker panels help add to Sienna's alluring profile. This look isn't all about style, though. The added structural support enhances safety and handling too. 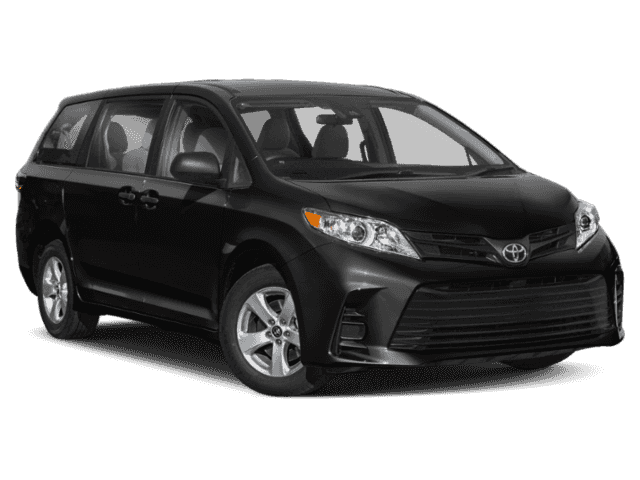 Sienna's spacious dash is loaded with tech, modern design and high-end accents. 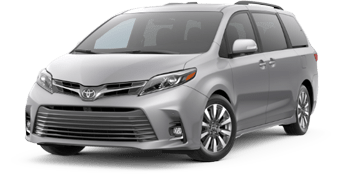 The color-screen display makes it easier to monitor Sienna’s advanced features, and a driver-centric console makes it all easier to control. With soft-touch materials all over, this is one dash you won't want to keep your hands off of. Not a bad seat in the house. With Sienna's available dual moonroof, your family can enjoy a fresh breeze or a clear view of the stars no matter what seat they’re in. Open the moonroof a little, or a lot—either way, you're in control of your environment with Sienna. Complementing Sienna's premium feel is available contrast stitching. Using genuine thread, this subtle design touch adds visual interest and contemporary style. It's one of many quality details that helps Sienna's interior stand out. Sometimes we need to go places when weather conditions are far from ideal, which is why the 2019 Sienna offers the added security of available All-Wheel Drive (AWD). By utilizing AWD with active torque control, this advanced system processes information sent from various sensors, then transmits the right amount of torque to the front and rear wheels, helping you maintain traction. Sienna simplifies connecting to your tech, thanks to the Entune™ 3.01 connected infotainment system. Its standard high-resolution 7-in. touch-screen display offers easy access to the available Entune™ 3.0 App Suite1, so everyone on board can enjoy real-time traffic and more fun apps2. Sienna also comes with Apple CarPlay® support, so you can use your compatible iPhone®3 to get directions, send and receive messages, make calls and listen to your own playlist—all while maintaining focus on your drive. Plus, with Amazon Alexa compatibility, simply ask to play music, read the news, tell a joke and more. 1Be sure to obey traffic regulations and maintain awareness of road and traffic conditions at all times. Apps/services vary by phone/carrier; functionality depends on many factors. Select apps use large amounts of data; you are responsible for charges. Apps and services subject to change at any time without notice. See Owner’s Manual for additional limitations and details. 2Apps and services subject to change. 3iPod®, iPhone® and App Store are registered trademarks of Apple Inc. All rights reserved. Everyone can stay connected with Sienna's available Wi-Fi Connect Powered by Verizon4. The advanced system supports up to five devices, making Sienna the hottest spot on the road. The power to do more. Now everyone can stay in charge thanks to Sienna's five standard USB ports5 spread across three rows of seats. 5May not be compatible with all mobile phones, MP3/WMA players and like models. Sienna's available Bird's Eye View Camera6 with Perimeter Scan uses front-, side- and rear-mounted cameras to display a panoramic overhead view. It helps you see more of your surroundings, so you can drive with confidence. 6The Bird's-Eye-View Camera does not provide a comprehensive view of the area surrounding the vehicle. You should also look around outside your vehicle and use your mirrors to confirm surrounding clearance. Environmental conditions may limit effectiveness and view may become obscured. See Owner’s Manual for additional limitations and details. Park and reverse with ease thanks to Sienna’s standard backup camera7. Available on Limited, the Panoramic Camera7 offers a 180-degree wide-angle view, showing both your distance and projected path. The available Bird’s Eye View Camera8 with Perimeter Scan helps you see nearby obstacles thanks to a 360-degree overhead view. All of this helps give you peace of mind for a more peaceful drive. 8The Bird's-Eye-View Camera does not provide a comprehensive view of the area surrounding the vehicle. You should also look around outside your vehicle and use your mirrors to confirm surrounding clearance. Environmental conditions may limit effectiveness and view may become obscured. See Owner’s Manual for additional limitations and details. An Advanced Airbag System9 helps protect you and your family with driver and front passenger dual stage airbags, driver and front passenger seat-mounted side airbags, a driver knee airbag, a front passenger seat-cushion airbag and Roll-sensing Side Curtain Airbags (RSCA) for all rows. 9All the airbag systems are Supplemental Restraint Systems. All airbags (if installed) are designed to inflate only under certain conditions and in certain types of severe collisions. To decrease the risk of injury from an inflating airbag, always wear seatbelts and sit upright in the middle of the seat as far back as possible. Do not put objects in front of an airbag or around the seatback. Do not use a rearward-facing child seat in any front passenger seat. See Owner’s Manual for additional limitations and details. 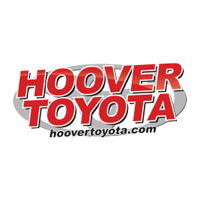 Proper vehicle maintenance is key to helping keep your Toyota running like a Toyota. That's why we include a no cost maintenance plan10 that covers normal factory scheduled maintenance with the purchase or lease of every new Sienna for 2 years or 25,000 miles, whichever comes first. 24-hour roadside assistance11 is also included for 2 years and unlimited miles. 10 Covers normal factory scheduled service for 2 years or 25K miles, whichever comes first. See Toyota dealer for details and exclusions. Valid only in the continental U.S. and Alaska. 11Roadside Assistance coverage is 2 years unlimited mileage. Does not include parts and fluids, except emergency fuel delivery. See Toyota Dealer for details and exclusions. Valid only in the continental U.S. and Alaska. 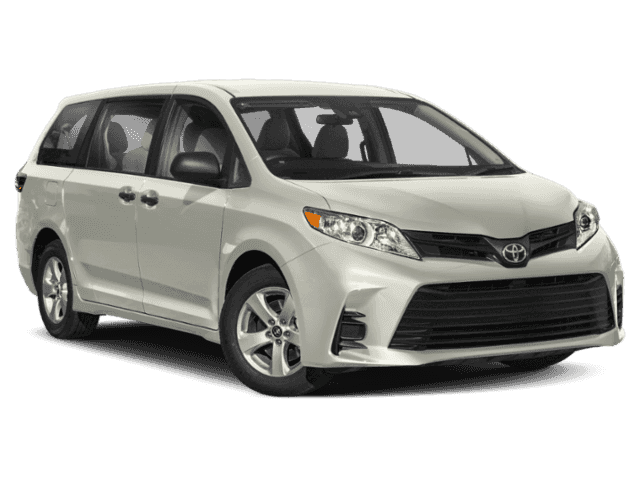 Sienna comes standard with the Star Safety System™, a suite of six active safety features that includes Enhanced Vehicle Stability Control (VSC)12, Traction Control (TRAC), Anti-lock Brake System (ABS), Electronic Brake-force Distribution (EBD), Brake Assist (BA)13 and Smart Stop Technology® (SST)14. 12Vehicle Stability Control is an electronic system designed to help the driver maintain vehicle control under adverse conditions. It is not a substitute for safe and attentive driving practices. Factors including speed, road conditions, weather and driver steering input can all affect whether VSC will be effective in preventing a loss of control. See Owner’s Manual for additional limitations and details. 13Brake Assist is designed to help the driver take full advantage of the benefits of ABS. It is not a substitute for safe driving practices. Braking effectiveness also depends on proper vehicle maintenance, and tire and road conditions. See Owner’s Manual for additional limitations and details. 14Smart Stop Technology® operates only in the event of certain contemporaneous brake and accelerator pedal applications. When engaged, the system will reduce power to help the brakes bring the vehicle to a stop. Factors including speed, road conditions and driver input can all impact stopping distance. Smart Stop Technology is not a substitute for safe and attentive driving and does not guarantee instant stopping. See Owner’s Manual for details. When the available Blind Spot Monitor (BSM)15 detects a vehicle, it illuminates a warning indicator on the appropriate sideview mirror to help you know when it’s safe to change lanes. Rear Cross-Traffic Alert (RCTA)16 works in much the same way. When you slowly back out of a driveway or parking spot, it provides audible and visual indicators to warn you of approaching vehicles. 16Do not rely exclusively on the Rear Cross-Traffic Alert system. Always look over your shoulder and use your mirrors to confirm rear clearance. There are limitations to the function, detection and range of the system. See Owner's Manual for additional limitations and details. *MSRP excludes the Delivery, Processing, and Handling Fee of $920 for Cars (Yaris, Yaris iA, 86, Corolla, Corolla HB, Camry, Camry HV, Prius LB, Prius c, Prius Prime, Mirai, Sienna, Sienna HV), $1045 for Small/Medium Trucks, SUVs and Van (C-HR, RAV4, RAV4 HV, Highlander, Highlander HV, 4Runner, Sienna, Tacoma), $1,295 for Large SUVs (Sequoia, Land Cruiser), and $1,395 for Large Truck (Sienna). (Historically, vehicle manufacturers and distributors have charged a separate fee for processing, handling and delivering vehicles to dealerships. Toyota's charge for these services is called the "Delivery, Processing and Handling Fee" and is based on the value of the processing, handling and delivery services Toyota provides as well as Toyota's overall pricing structure. Toyota may make a profit on the Delivery, Processing and Handling Fee.) Excludes taxes, license, title and available or regionally required equipment. The Delivery, Processing and Handling Fee in AL, AR, FL, GA, LA, MS, NC, OK, SC and TX will be higher. The published prices do not apply to Puerto Rico and the U.S. Virgin Islands. Actual dealer price will vary.